PWM inverter circuit based on SG3524 : 12V input, 220V output, 250W. 250W PWM inverter circuit SG3524. A 250W PWM inverter circuit built around IC SG3524 is shown here. SG3524 is an integrated switching regulator circuit that has all essential circuitry required for making a switching regulator in single ended or push-pull mode. The built in circuitries inside the SG3524 include pulse width modulator, oscillator, voltage reference, error amplifier, overload protection circuit, output drivers etc. SG3524 forms the heart of this PWM inverter circuit which can correct its output voltage against the variations in the output load. In a non PWM inverter the change in output load directly affects the output voltage (when output load increases output voltage decreases and vice versa), but in a PWM inverter the output voltage remains constant over a range of output load. Circuit diagram of 250W PWM inverter. Resistor R2 and capacitor C1 sets the frequency of the ICs internal oscillator. Preset R1 can be used for fine tuning of the oscillator frequency. Pin 14 and pin 11 are the emitter terminals of the internal driver transistor of the IC. The collector terminals of the driver transistors (pin 13 and 12) are tied together and connected to the +8V rail (output of the 7808). Two 50Hz pulse trains which are 180 degree out of phase are available at pin 14 and 15 of the IC. These are the signals which drive the subsequent transistor stages. When signal at pin 14 is high, transistor Q2 is switched on which in turn makes transistor Q4, Q5, Q6 ON are current flows from the +12V source (battery) connected at point a (marked with label a) through the upper half of the transformer (T1) primary and sinks to ground through the transistors Q4, Q5 and Q6. As a result a voltage is induced in the transformer secondary (due to electromagnetic induction) and this voltage contributes to the upper half cycle of the 220V output waveform. During this period pin 11 will be low and its succeeding stages will be inactive. When 11 of the IC pin goes high Q3 gets switched ON and as result Q7, Q8 and Q9 will be also switched ON. Current flows from the +12V source (marked with label a) through the lower half of the transformer primary and sinks to the ground through transistors Q7, Q8, Q9 and the resultant voltage induced at the T2 secondary contributes to the lower half cycle of the 220V output wave form. The output voltage regulation section of the inverter circuit works as follows. The inverter output (output of T2) is tapped from pointâ€™s labelled b, c and supplied to the primary of the transformer T2. The transformer T2 steps down this high voltage , bridge D5 rectifies it and this voltage ( will be proportional to the inverterâ€™s output voltage) is supplied to the pin1 (inverting input of the internal error amplifier of the IC) through R8, R9, R16 and this voltage is compared with the internal reference voltage. This error voltage will be proportional to the variation of the output voltage from the desired value and the IC adjusts the duty cycle of the drive signals ( at pin 14 and 12) in order to bring back the output voltage to the desired value. Preset R9 can be used for adjusting the inverters output voltage as it directly controls the amount of voltage fed back from the inverter output to the error amplifier section. IC2 and its associated components produce an 8V supply from the 12V source for powering the IC and its related circuitries. Diodes D3 and D4 are freewheeling diodes which protect the driver stage transistors from voltage spikes which are produced when the transformer (T2) primaries are switched. R14 and R15 limit the base current of Q4 and Q7 respectively. R12 and R13 are pulldown resistors for Q4 and Q7 which prevents their accidental switch ON. C10 and C11 are meant for bypassing noise from the inverter output. C8 is a filter capacitor for the voltage regulator IC 7808. R11 limits limits the current through the indicator LED D2. Mount the SG3524 on a holder. All capacitors other than C10 and C11 must be rated at least 15V. Preset R9 can be used for adjusting the inverterâ€™s output voltage. Preset R1 can be used for adjusting the inverter’s operating frequency. Transistors in the driver stage require heatsink. T2 is a 220V primary, 12V secondary, 1A transformer. T1 is a 12-0-12 V primary, 220V secondary, 300VA transformer. Driver transistors must be isolated from the heatsink using mica sheets. Mounting kits for these transistors are easily available in the market. An optional finned aluminium heatsink can be attached to the 7808. If 1A bridge is not available, make one using four 1N4007 diodes. From where i can get transistor 2N6227 in india? please tell me that place or provide any link for that camponent. You can use 2N3773 OR 2N3055 instant of 2n6227. I hope it is help you. Thanks 4 d schematics. pls to construct a 5KVA inverter, what adjustments should I make in this circuit? I am presently constructing an inverter using your circuit diagram. Please, I want you to discripe how I can use voltmeter to measure the output of oscillator at pin11 and pin14 of IC SG3524. Please, why do you not respond to my requet posted on 1/12/2014. Treat please. Please, why do you not respond to my requets posted on 7/11/2014 and 1/12/2014. Treat please. You should use frequency enable DMM meter . normal volt meter can not measure the isolation. PLEASE. WHT IS THE FUNCTION(S) OF TRANSISTOR BC327 IN THE CIRCUIT. MORE GRACE TO YOUR ELBOW. sorry for the delay in reply, the transister collector should be connected to ground then it will act as an integrater for soft start. only wave form can be checked with an oscilloscope, multimeter cannot measure it. you can use a frequency meter to find the frequency available at those pins, should be 50 Hz. I think this is very useful as the circuit is well explained except this function of BC327. Thank you for that. Someone help me ,i made it but the o\p of sg3524 is zero.whats the prob. I made this circuit using IRF3205 instead of the three driving transistors. I didn’t test it on loads yet, but when working as OC I had 210 volts to 70 volts output range by varying R9 between 0-5K ohms. Please sir, must the output at pin 14 and 11 be the same with that of the driver’s unit? Because the output at pin 14 and 11 reads 3.87 while the respective driver’s reads 4.07. Pleae sir, can I convrt the 250Watt inverter to 1000Watt or more by just inceasing number of driver transistors or mosfets and the suitable transformer T2 without alter the oscilator and the feedback circuits, thanks. sir i don’t understand the function of BC327 there in the ckt. I have build it but the output voltage changes when increasing load. what must be the problem. Adjust the 2.2k pot, to set the pulse width modulation, so that even when u increase load, the voltage will not drop below 220v, provided u are not overloading. Overloading wil put ur mosfet to stress and damage, since ur mosfet wil do more work. This circuit doesnt contain battery low shut down. 2N6277 is a good switching transistor with very low switch on resistance. Bipolar transistors are much faster than MOSFETs of course their switch on resistance is quite lower in the order of few milli ohms. You may try mosfet in place of 2N3055 & 2N6277 combination retaining BC337. As I have not tried I can only suggest. You may try and give us a feedback on that. Output voltage will be constant with varying load, due to voltage feedback. It will not be constant in cd4047 circuit. Constructors who have basic knowledge about voltage regulators might not have made the mistake and would have completed the project successfully. Thank you for pointing the mistake. sir, I unknowingly bought IRF540 when I was supposed to get IRFP250 but when I tried to check the equivalent they have just little difference.. so can I use it in place of the Q7,8?? thanks! Yes both MOSFETs are almost have the same parameters can be substituted. hi! am so troublesome which I know of, please wanna know if my calculation is correct?? if I say I want an inverter of 3750w and I want it operate for 24hrs round clock, taking note of the the supply voltage to be 60v(5 batteries in series) the battery amp should be 60V30AH?? Inverter of 3750 watts say power factor and the inverter loss etc etc say the efficiency is just 65% Then it should be 3750 / 0.65 VA rating in the primary of the transformer. Approx 5800 VA. So you want an operation for 24 hrs. 5800 X 24 = 139200 VAH. with a 60 volt battery the AH requirement will be 139200 / 60 = 2320AH battery. With your 60Volt 30AH battery it will work for a maximum of 20 minutes. Not even for 24 minutes how could be for 24hrs ???!!! Sir, I have requested for a transformer with 750va which is the T2(12-012)V now what about the T1?? Should it be specially made or we can get the normal type at the market?? For a 750VA transformer (500 watts load approx)you can calculate from the above calculations. approximately 12 volts 75AH batteries 4 nos you have to use in series. Okay, thanks! but one question, a non-inverter transformer is far different from an inverter transformer?? sorry to bother you, I forgot to include in the text what cables or wires to implore in the connection?? though I aware of the fact that I do need jumper wires but are there other parts where I might need wires more thicker than jumper wires?? All wires connecting transformer primary to positive supply and the wires connecting to transistors Q4 to Q9 should be 4sq mm or better and should be as short as possible. what part of the stages requires a heat sink?? In pwm inverter, does battery variation affect o/p voltage? that is will the output reduce as battery voltage reduces? hi! with little I understand, that’s an advanced circuit configuration using PWM.. if the circuit is using the required specs it will have no effect with the battery, the battery will discharge at a steady rate depending on the load and the load output remains same irrespective of the battery discharging…. hello, i like this circuit and will make sure its constructed. i have few questions to ask. 1. will the output be reducing as battery voltage reduces? 2. can i uses 8-0-8 , 230v transformer? if yes what would be my output? thanks! Need your urgent help & advise for a Solution the following problem encountered as listed below and What are the possible Root Causes & Reasons of my problem encountered here ?? 1)Can not obtain Output Voltage of 230V AC & Output Current of 2A AC by using 500VA(500Watts) Transformer(T2). I hv completed building the circuit accordingly but obtained maximum output voltage only 83V AC at Secondary Winding of T2)& Maximum Output Current 0.06A only using load 28W 230VAC Bulb Or 100W 230V AC Bulb, Observation Bulb can light up dimly only. The Input Current of 8A ( Ammeter Reading ) 12V at Primary Winding of Transformer T2. The Transformer T2 used here that I bought from the shop is 500VA(500Watts) 12V/230V AC. Also I used Car Battery Lead-Acid Type 12VDC,60AMax. From the pin 14 of SG3524 using Q2(BC337),Q4 TIP122,2N3055,4pcs 2N3773 replaced 2N6277 that is Not available from the shop and adding one Small Resistor of 0.1 Ohms in series with Primary Winding Of Transformer T2. The Load 28W 230V AC Bulb Or 100W 230 AC Bulb can not lighted up without added this 0.1 Ohms Series Resistor.Not Sure Why need to add this 0.1 Ohms Resistor, pls share your thought & advise urgently. Wherelse from your project Original Circuit do not require this additional 0.1 Ohms Resistor to Transformer T2 that can even produce Output Voltage 230V AC from Transformer T2 per your circuit description & explaination. Do I missed something here ? From Pin 11 ( SG3524 ) using Q3 (BC337), Q7 (TIP122), 2N3055, 4 pcs 2N3773 replaced 2N6277 that is Not Available from the shop. I did obtain 50Hz Output from Pin 14 & Pin 11 of SG3524. Hope to hear from you all soonest possible & thks in advance. sir, I want 10KW Solar inverter circuit. If possible please send me as early as possible. i made that inverter it produces a 220v well with neon lamp but when i connect it to a computer or LCD tv the output became not stable the frequency became not stable decrases and increases..
My inverter is only showing the green light but no output.what may be the cause? Have you connected you DC supply to Transformer T2 primary center tap. Without this connection the final output transistors will not get supply to function. Sir i need to build a PWM inverter with output voltage control(50v-230v). Please mail me a proper circuit if u have. can you send me this sch file, Plz. thanks for the schematic. I will try to built it. But I would like to ask you, do you somehow have some osciloscop plots of the output waveform? Or Pin11/pin14 IC? Thank you again for the schematic! This circuit can be was transformed to sinewave by me . by redesigning the oscillator circuit .adding three more IC chips after the Sg3524 pulses to produce sinewave at the output .If u need the circuit and a transformerless 3-stage automatic charger 12v 15amps . Hi Simeon, thank you! Please send the circuit. Q2 and Q3 are buffers not to load the IC. Check the quality of the inverter transformer and battery capacity. T2 primary voltage rating should be 11-0-11 or even 10.8-0-10.8 for a better transfer from 12 volt battery. For 5 hrs backup operation at rated load you require a 140AH 12 volt battery with a good charger. yah me too having this problem when conect a lcd tv or computer it keebs go on and off and the fan run very slowley but when i connect only fluresnt light or bulb it goes very well what could make that??? 1. T1 is not shown in the diagram. 3. If I want to add more transistors to archieve for example 1000W, which transistors would be added and doe it require more base resistors too? 4. Kindly expanciate this please: If a transformer is rated as 5000W, 220V by 12-0-12V, how can I determine its o/p current using DMM or any other devise? Expecting your response please, thank you. Nice circuit..let me ask can i use Mosfet transistor as driver for the replacement Of 3055? thanks for the good work. it is very inspiring. please can you send me the explanation about the whole circuit. i have decided to use it as part of my final year project and i need elaborate explanation about the function of each components in the circuit. although i know some but not all. for anyone that can help me, my email is ayobamiabdulsamad@yahoo.com . thanks all. i will expect response from anybody cos i need it urgently. Hello Ayabami, We have given a detailed description of the circuit and list of components. Let me know if you have any other doubts. Hi Oyinz instead of using wire for transmitting data from one system to other, you use optics to do the job so that you get isolation between sender and receiver. Yes you can use more transistors in parallel to achieve higher power output. Where ever it is written +12 connect them together to +12 of the battery. the connection shown as earth should connected together and in turn should be connected to -ve of the 12 volt battery. Thanks alot sir, i really learned alot. My question is this, what formula do you use for calculating the transformer number of turns and the gauge to use, and even the size of the core, and lamination that can be used, thanks alot, i will be greateful if you will mail me back. Thanks alot more grace to your effort. 1.where i will connect on 12- in this circuit..?? Mujhe ye janna hai k is circuit me 2 transformer kyon use kiye gaye hain ? plz send me 2n6277 transister available shop address in india. 2N6277 transister availble shop address send me plz in bangalore, india. Let’s all go for mosfet….mosfet can perform the work excellently….I use mosfet mine is still working…with mosfet we can eliminates Q4 to Q6 and so on..connect the 100ohms resistor directly to the gate. The voltage present at the 100ohms resistor is enough to turn it on….using this mosfet little heat sink is enough…..bcz mosfet emits little heat………for more on how to do this text or call me on …08038252105….im available to assist….. In this circuit, I observed that therre’s no battery. the circuits takes a rfaction of the output, rectifies it and uses it as the input DC. Does that mean that once a battery triggers it ON, we can remove battery? Hi Chinedu Without battery this cannot work. The battery is connected between inverter output transformer centre point which is written as +12Volt DC and negative of the battery to common ground. The inverter output voltage level is taken as feed back information to maintain the output voltage constant with variable load, within its capacity. plz send 2n6277 transister available shop address. Hi Madan it is freely available in India around INR25/-. Thank for this circult, please sir kindly tell me perhaps this is square waves or sine wave. which line can this be connected. Thank. Please reply to my mail. What is the purposely thing you won’t 2 do with the transformer. hi.. i dint understand the use of another 220v primary 12v secondary 1 amp transformer. for what purpose is it used for?? Please, how do I change the transistors to MOSFETs? which mosfet is should be used and how to connect it please send the circuit. use IRF3205 for high power output…….connect the gate to that 100R resistor directly and eliminates other transistor…. Pls can you give a full explanation of the modified and it connection circuit. Means we have to replace all transistors (from Q4 to Q9 ) by two parallel mosfets irf3205 ?? I have studied this inverter circuit and compared it to other PWM Based inverters.others are supplied with 12V AT PIN 15 BUT THIS IS 8v . HELP ME WITH AN EXPLANATION. It doesn’t matter, the 3524 has an internal 5 volt regulator. You can give any voltage between 8 and 15.
suppose I want to use a high frequency transformer like the one used in china’s JEC inverter.What modifications will I have to make to the above inverter? hi kip. just change the frequency from 50hz to like 1khz. i.e change component values between pins 6 and 7.
try and wish you the best. sir, i am building this circuit for an investigatory project and i would just want to ask a few questions. 1.what is the required dimensions of the heatsink for the driver transistors and the ic 7808? 2. shall i use a 12v 40ah car battery for the supply?.what is the specification for diodes 3 and 4? really need your help,.,.,. 7808 doesn’t need a heatsink and the driver transistors too. Use either 4x1n4007 general purpose diodes or a bridge rectifier instead. u had workd on diz ckt â€¦cn u giv ur material how u workd and ckt operation â€¦. i am mechinical studentâ€¦. bt wanna design it. I designed this circuit using a 48v 200ah dc input, but when coming ON on load, it keeps tripping OFF. Please advice. Thanks..
when you’re talking 50 or 60 Hz there is no need for very high speed as you say. Transistors are OK. I have read the whole article and really appreciate the fact that it supports error correction. However it is a square wave inverter, is it any way that it can be revised to be a modified square wave inverter using same SG3524 or SG3525 IC for mosfets. I have seen many diagrams and yet to see a inverter project for a modified sqaure wave but with stable 220v at its output. plz can any one tell what must be the voltage at pin 11 and 14 in this circuit …. please help me frnds !!!!!!!!!!!! it will be very helpful for me…..
how to choose the rate of current transformer? I have made a inverter 100w, but the transformer is not suitable, so when I use it, the output voltage drop. please help. Same problem with me too. I am getting output voltage of 3.6V at pin 11 and 14 and in my CRO, the output shows the square wave form too.. I don’t have the provision to connect both channels simultanoursly. Hence I am not sure if they are switching alternatively. When my primary side of transformer is kept open(Between centertap and 12 Side) and check the voltage reading with my multimeter, it shows 12.1 V which is from my powerful 60AH battery. Soon as I connect it to the transformer, the voltage accross the terminal on my primary drops to 6.5 to 7 volts. This is under noload condition. When I checked the current at primary, it consumes around 8Amps. The transistors heats up tremendously. Could you please help me Nickk ? Hi for pure sine wave generation a function generator chip with driver and output transformers with MOSFETs or transistors to be used, with AGC and other feed backs to be used for stability. Hi Eniola it is a Motorola power transistor there is no equivallent. you may use 3nos of 2N3055 in parallel. Hi Sim this inverter is more effficient as per load requirement the output is pumped. As there are filter in the output it is a modified squarewave without sharp raise and fall, so connected digital equipment will not get spoiled. What are the advantages of this inverter waveform over the normal squarewave ? sir, this is a perfect circuit.. But please I couldn’t get 2N6277 transistor in the market, so which one can I buy in replace of it and that will work efficiently. Thank you sir. Hi Sim except where you require only pure sine wave. Is this inverter waveform suitable for all kind of loads ? Hi Sim it depends on the lamination its permeability etc. That you please leave it to a good transformer designer. You give the spec to them they will take care. specify 10.8-0-10.8volt primary, secondary 230volt transformer with a capacity 300VA. What should be the number of turns for the primary and secondary of the transformer windings ? Hi Naren the two pins are base and emitter. the case itself is collector. Please take advice from electronic hobbyist nearby you. Can i use this inverter circuit to power inductive load ? 2N3055 it has only 2 terminals how can i connect it into pcb. Hi Prakash all connections shown as ground to be connected to negative of the battery. where I have connect -ve terminal of the battery in this circuit. Hi Sim can be used. as an additional protection use a 250volt or 270 volt VDR in the out put of inverter. Can i use this inverter circuit to power my LCD TV ? Hi Sim it is squarewave. Is this circuit a squarewave or modified sinewave inverter ? hi. there is error on your 7808 regulator pin configuration. the right configuration is pin 2 to GND and pin 3 to IC. hi. pls can bc337 in your 250w pwm inverter drive 8 pararell mosfet irf3205? pls help thanks. Hi everyone, my eyes are not up to par these days, so if I am wrong, ignore this question and remark. Where is the 7805 listed in the related description? And, yeah my eyes,,but is this the worst display of a circuit,,, streeeeeeetched out from top to bottom of page,,I can’t read the parts! what are the numbers on the transistors? Thee only one I am sure of is the “3055” the rest are so blurred from the stretch it’s impossible to read. Whats the point of a PWM if it isn’t a modified or simulated sine wave? You could get a square wave with less parts to fail and wind your own M.O.T. 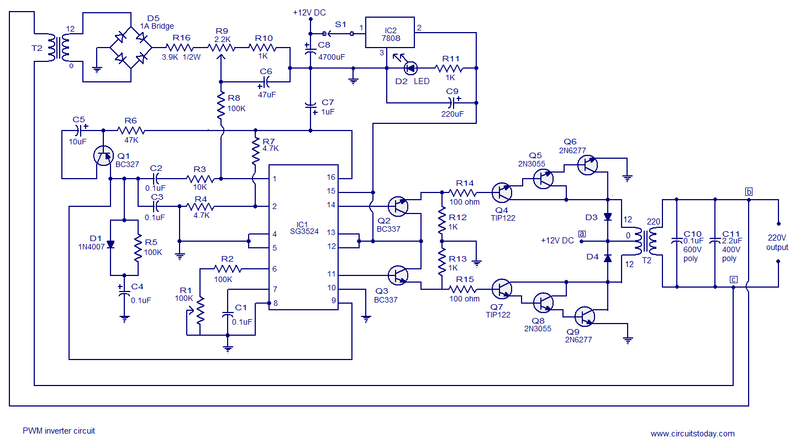 to get the amp coverage and use beefy Switching Transistors to handle the demand. This is just an in my opinion over built plain ole inverter. There is no problem with the circuit diagram. It looks compressed because it is a wide diagram and the current theme of the site will just compress it to fit into the content area. Just right click the image and open it in a new tab. Then you can see the diagram clearly. PWM is used to keep the output voltage of the inverter steady irrespective of the load variations. It is not 7805 and it was a typo error from my part. It is actually 7808 and I corrected it in the description. This circuit works well and many have successfully assembled it. sir ….i waana work on dis ckt as my main project…… cn u giv me proper workng of dis ckt ..itz analysis nd …connections ……..i wanna material of it …….how u workd . Thanks for the detailed explanation of how the circuit works, which I have fully understood. However not all of the circuit was explained. Could you (or someone else) explain what the circuitry connected to pins 1,2 & 9 does? This includes Q1, D1, R3,4,5,6,7 and C2,3,5. Sir, it is realy a good apparunity to learn about electronic circuits. If it is possible to send me a procedure of testin of transistor and other semi conductors in a circuit or out of circuit by testing meters. I realy appriciate your afforts to communicate such type of information to tecnical people. Hi Nayeem D3 and D4 can be 1N5404. S1 is for on off for the inverter. PLEASE REPLY ME AS SOON AS POSSIBLE IT VERY URGENT. Hi Mike the output will be pure square wave. What kind of output wave? Modify sine wave? or pure sine wave? Come join the forum n share your knowledge. Link to the forum is provided on the top of this page. Welcome all who wants to learn and share…. I need all the details about inverter can you pls send me about that.